A new experience for the NETpositive team last night seeing our software showcased alongside some amazing apps and widgets at the inaugural The Edge Awards in Bristol. 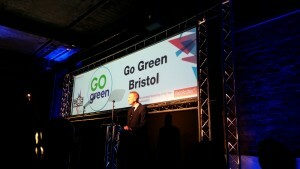 We were proud to be finalists in this celebration of entrepreneurship, design and gadgetry with our GoGreen tool which has now helped over 300 Bristol businesses create a sustainability action plan and access locally relevant support and guidance. We were delighted to see the eventual winners in our category of Environmental Technology; Neighbourly gain recognition for their fantastic platform, which matches hungry people with surplus food across the city.